World Backup Day is right around the corner! That means now’s the perfect time to spread the word about the importance of a reliable, easy-to-use backup solution – and earn through limited time offers! •	Easy: Any user can intuitively understand Acronis solutions and reliably use them to back up whatever needs to be protected in just a few clicks. •	Efficient: Saving time and money is easy with backup and recovery that’s up to 10x faster than other tools, allowing users a quick return to business as usual. •	Secure: The only backup solution with AI-based anti-ransomware protection defends data on more than 20 platforms and stopped more than 200,000 unique attacks in the last year. 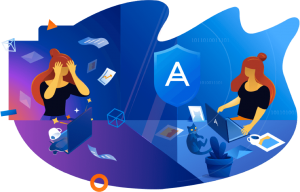 Up to 50% off Acronis True Image 2019 for Personal Backup. 15% off Acronis Backup for Businesses of Any Sizes. *Acronis Backup Advanced Workstation Subscription License* & Acronis Backup Advanced Server Subscription License. Valid only for these license types in North America.